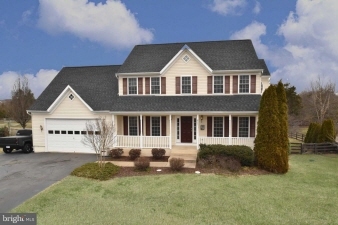 Don't miss this meticulously maintained single family home! 4 bedrooms, 2 full, 2 half baths. Elegant box and chair rail molding, new hardwoods on main level, expansive front porch, and 1/2 acre fenced lot! Enjoy 3 bright and airy levels of living space, formal living and dining room, a cozy gas fireplace in the family room, kitchen with breakfast room with a bump-out window and much more. Luxury master suite with private sitting room/4th bedroom and luxury master bathroom with large soaking tub and separate shower. Huge recreation room in the basement perfect for entertaining + hobby room. Walkout to the covered back porch and enjoy the outdoors on the brick patio overlooking the large backyard. 2 car garage, new roof 2018, and many more upgrades. Must see!